Reconstructing a building with new materials is at odds with one of the most important principles of modern western building conservation, namely the preservation of a physical object in its original materials as a historical source. That is why reconstruction is so controversial within heritage circles and elsewhere. During the Docomomo seminar a number of speakers discussed the theme of reconstructing modern heritage in a session entitled Reco.mo.mo. How real is imitation, how beloved is the original? The session kicked off with Professor Marieke Kuipers. The discussion about reconstruction has been taking place for decades but is rarely conducted in public. According to Kuipers there is scarcely any debate about the function, form or future value of rebuilding or the authenticity of materials. Rebuilding modern heritage is allowed, because it happens, she stated. That discussion is not relevant, according to her. 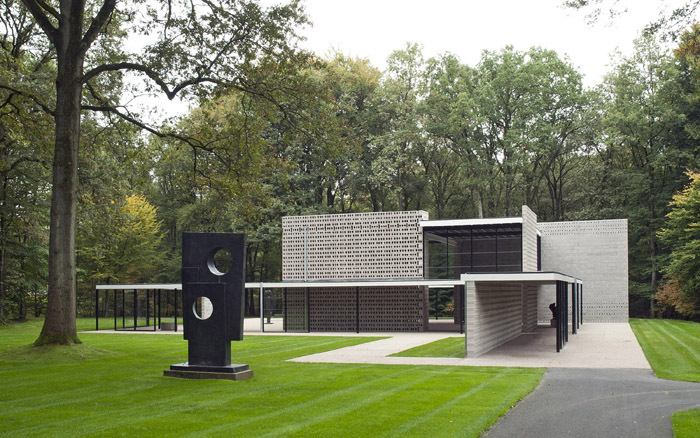 Yet it is conducted all the same with respect to projects like the Rietveld Pavilion in the park at the Kröller-Müller Museum which has already been rebuilt twice on the same site. Most speakers were of the opinion that you should never demolish an existing building in order to replace it with a replica. Bertus Mulder is not a proponent of it in principle either, but, he explained, the Rietveld Pavilion had already been rebuilt in 1965 by a young colleague of Rietveld and had numerous structural faults owing to his inexperience. Rebuilding is, in the eyes of Kuipers, fine but it should then no longer be classified as heritage. After all the word heritage implies an historical component. Historical buildings  its in the name already, said Kuipers  reveals physical traces of history. That is lost in rebuilding. An additional reconstruction is fine as long as its clear what has been altered and where. That does not necessarily have to be revealed for a wide audience on site, but it is of significance that the story behind the reconstruction is told. Architect Wessel de Jonge emphasised that insight into the interventions and the ideas they embody should not only be offered afterwards in a publication or report but also in advance so that an open discussion about the most appropriate approach can be conducted. During the seminar De Jonge put his own example of Zonnestraal Sanitorium on the chopping block, as he put it, because of the projects tendency to provoke heated debate. After all, most of the original building had already disappeared, except for the concrete shell and yet it was called a restoration at the time. His office was commissioned to restore the vanished grandeur of Zonnestraal. Developers often say they want to restore a building to its former glory but that is only possible, explained De Jonge, if some of it still exists. If a small part is missing, he said restoration is the right term but if most of it has disappeared then reconstruction is the word to use. The Rietveld-Schröder House for example is a partial reconstruction. The clear three-dimensional spatial image has been preserved but the colours differ as do the technical materials. Another example is the assembly hall at Schiphol by Rietveld. That building disappeared to make way for the fifth runway and was rebuilt elsewhere. According to architect Bertus Mulder he kept the original space but improved the structure, materials and even foundations. All the same, the pavilion has again been designated a protected monument. The question is whether that status is justified. Not in most cases, according to the assessment criteria widely applied in the heritage sector. The argument made was that a reconstruction is essentially a copy because the material it is made from is not original. Yet this is not a problem for everybody. De Jonge claimed there had been a shift towards conceptual thinking. Mulder came up with a quote to illustrate that Rietveld focused on defining space and that its materialisation was not of importance to him. Next to address the seminar was architect Victor Veldhuijzen van Zanten. He told of his desire to finally build the Maison dArtiste by Van Doesburg and Van Eesteren, which was exhibited as a model in 1923. Lack of time meant there was no discussion possible about whether it is a good idea at all to construct a design that is an icon of Dutch Functionalism but was never intended to actually be built, and which structure wasnt even elaborated. That was a pity, because it can easily have implications for the unique and iconic values of the Rietveld Schröder House as the only built manifestation of De Stijl. The question therefore is whether the original design is more important than the materialisation. If that is the case Veldhuijzen van Zanten might be better off abandoning his crusade. The new construction materials of the Modern Movement served functionality and were produced in bulk. Is that perhaps why they are less authentic and replacement is more tempting?, De Jonge wondered. Whether historical building materials like roof tiles, bricks and timber components were less functional was not debated. Construction historian Ronald Stenvert emphasised that in every era everybody can avail of the same building materials. It doesnt matter whether or not a building belongs to the Modern Movement. It is about the historical continuity and the different layers. Research can reveal the story of a building and explain why it looks they way it does. Colour researcher Annefloor Schlotter contended that scientific examination can be useful to that end. The information it can produce is, she said, essential in making choices later in the proces. Sometimes the original colour scheme is unaffordable or beyond repair, but one should try to preserve the source or keep it in its original position. With paint, a temporary material that generally needs redoning every five years, it is more important to reconstruct the appearance than to preserve the physical layer itself. We simply have to accept that elements and materials wear out. Not every component has to be restored in the same building; reconstruction at another location can sometimes make more sense, but Stenvert argued that erasing the story during reconstruction (often for aesthetic reasons only) should be forbidden. The Kiefhoek housing scheme by J.J.P. Oud, reconstructed by Wytze Patijn, was in a technically poor condition and the dwellings were small. Restoration would have been complex and very costly, and would not have produced agreeable living conditions. The strategy to deal with the housing typology was more drastic, contended Patijn. Ouds modernist view of the standard dwelling, of which this was one of the few built examples, has practically disappeared. Rolf van der Weide of the Bo-Ex housing association in Utrecht showed two carefully restored blocks of flats by Rietveld in Hoograven, just to the south of the centre. Here too the floor plans of the dwellings were altered, but the complex has retained its function as social housing. The outdoor space of the Rietveld complex in Utrecht functions wonderfully well again thanks to a few small alterations. Since the restoration the dwellings have become very attractive to first-time buyers and add a new vitality to the neighbourhood, without the need for large-scale interventions. Even in a neighbourhood like Kanaleneiland, which is larger in scale, has a bad reputation and contains architecture that is less well appreciated, Van der Weide argued that restoration is the right approach. Meurs did not agree fully with this. In post-war housing districts the scale and number of dwellings is large and they cannot be tackled in an integral manner. The outdoor space has often been rendered useless. A new structure, a new housing typology and another architectural interpretation can benefit the neighbourhood, said Meurs. Demolition of the original and its subsequent rebuilding on the same site was not an option for many people. The consensus among the speakers was that a replica can never replace the historical values and should therefore no longer be classified as heritage. Most of the speakers did, however, agree that plenty of reconstruction is permissible, at least if it enhances the experience of the concept and does not erase the story of the building for aesthetic reasons. And as long as a thorough debate about the interventions is conducted beforehand and they are documented afterwards. The debate about reconstruction is therefore academic and totally absurd, argued Paul Meurs. Each case should be judged on its own merits. If you oppose reconstruction, then you exclude many creative solutions. After all, said Meurs, it is about social usage, about a lively city. The seminar took place on May 20 in Utrecht. The contributions of most speakers are gathered in a book entitled reco.mo.mo, published by DOCOMOMO.